This year's annual pro-democracy march in Hong Kong has gone ahead with far fewer participants than previous years. One media report said 10,000 people took part in the rally, compared to hundreds of thousands last year. The rally was being held to mark the eighth anniversary of the territory's handover from the UK to China. Hong Kong's new chief executive, Donald Tsang, took part in an official ceremony earlier on Friday, which was interrupted by pro-democracy hecklers. After raising a flag to mark the anniversary, Mr Tsang said the people of Hong Kong had become more patriotic since the 1997 handover from Britain to China. "Never has the bond of flesh and blood, the inter-dependency between Hong Kong and the mainland, been so real to us," Mr Tsang was quoted as saying by the Associated Press. On 1 July 2003, half a million people took to the streets against an anti-subversion bill they feared would threaten their civic rights. 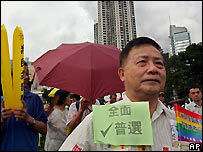 Last year, an estimated 200,000 protesters marched again to demand direct elections for Hong Kong's leader by 2007. But since then the push for full democracy has lost momentum. Mr Tsang replaced the unpopular Tung Chee-hwa last month, and the economy is recovering, leading to a calmer political atmosphere.